Many components do not only have to be highly precise on the outside, but the primary focus is on generating optimal surfaces on the internal geometries. For example, the slightest scoring on injection system components will lead to an undesirable notch effect, stress concentration and, consequently, operational failure. Electro-chemical machining (ECM) ensures perfect results in the inner forming and galleries of very different components. When it comes to demanding components in high-tensile materials, EMAG's ECM process shines. Electro-chemical inner forming leaves the component completely free of burrs. The EMAG experts optimize the tool cathode geometry to achieve perfect internal chambers. Even filigreed components can thus be inner-formed with great precision and reproducibility. Furthermore, in contrast to chip-producing processes, the microstructure of the material is not adversely affected. Another important factor is EMAG's modular machine concept, with power electronics and generator technology adjusted to suit the relevant manufacturing requirements. Electro-chemical inner forming with EMAG machines guarantees economic viability and process integrity. 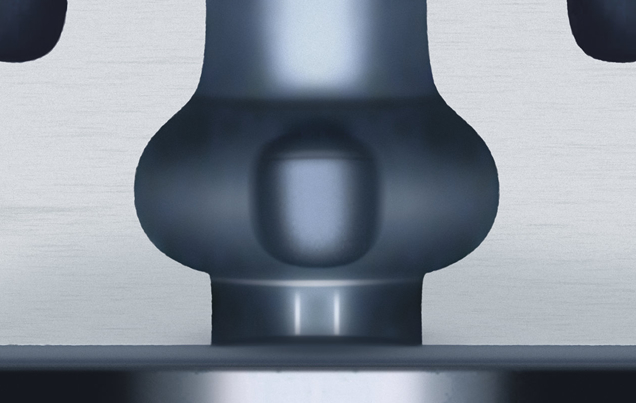 Injection nozzles play a decisive part in the efficiency levels of engine systems. High-tensile materials and a perfect internal geometry ensure that this tiny component works correctly and fulfills its promise of longevity. How can one efficiently machine the inside of an injection nozzle without leaving tool marks and burrs? EMAG's answer is: electro-chemical inner forming and chamfering - an efficient process that generates high-precision surfaces. The gallery on the inside of the injection nozzle is generated with the help of a cathode of suitable design. The radial effect of the current generates optimal surfaces and geometrical transition points. Other advantages offered by electro-chemical inner forming: low tool wear and the certainty that the material's microstructure is not adversely affected by the process.